The Young and the Restless (Y&R) spoilers for Tuesday, November 14, tease that Dina (Marla Adams) will finally resurface in Genoa City. Jack (Peter Bergman) and Ashley (Eileen Davidson) will be relieved to see their mother. They’ll suggest that they were worried sick. Unfortunately, Dina’s return will lead to some bad news. Paul (Doug Davidson) will arrive and insist that he’s placing Dina under arrest. The Young and the Restless spoilers say Dina will smile and hold out her arms. She’ll ask if Paul’s going to cuff her. It looks like Dina might have some memory gaps again. She may not remember stabbing Nikki (Melody Thomas Scott) at the Newman gathering. Even if she does, Dina might not think it was a big deal in her current state. She has major issues right now thanks to Alzheimer’s and the stroke that made her symptoms worse. Meanwhile, Victoria (Amelia Heinle) will express concern about Abby (Melissa Ordway). She’ll talk to Victor (Eric Braeden) and they’ll agonize over Abby’s decision to leave with Zack (Ryan Ashton). They’ll both fear that Zack is capable of just about anything. Victor will hope to resolve this nightmare as soon as possible, but he’ll need some help. 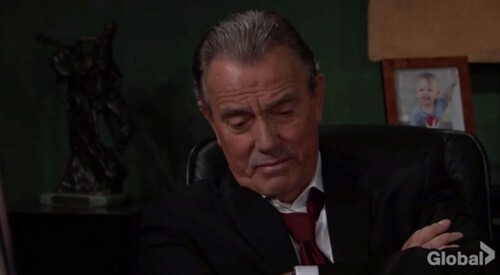 The Young and the Restless spoilers say Victor and Jack will put their heads together on this. They’ll team up to track down Abby before it’s too late. It turns out Dina could hold the key to solving this mystery. On Monday’s episode, Dina pops up in the back of Zack’s car after he forces Abby to go elsewhere. Sadly, Dina may not be able to remember much about the evening’s events. Nevertheless, Jack and Victor will try to make progress in their search on Tuesday. Other Y&R spoilers say Lauren (Tracey E. Bregman) and Sharon (Sharon Case) will face off again. They’ll both hate the fact that Scott (Daniel Hall) is in danger, but Lauren will still take this opportunity to lash out at Sharon. She’ll contend that none of this would’ve happened if Sharon hadn’t seduced Scott. Of course, Sharon will defend her relationship and urge Lauren to back off. They’ll continue to clash while Scott and Abby sweat it out in a storage unit. Zack will lock them in there on Monday, so they’ll face some scary moments as they try get out of this mess in Tuesday’s episode. The Young and the Restless fans won’t want to miss the shockers ahead. We’ll give you updates as other Y&R details emerge. Stay tuned to the ABC soap and don’t forget to check CDL often for the latest Young and the Restless spoilers, updates and news.